Valley Forge, PA – If you love lamb shanks, then try them at the St. Sophia Greek Festival. Their Tender, tasty and leave you wondering how the parishioners prep them so good. Throughout the night, attendees ravished the traditionally prepared lamb shank and other Greek platters. Lines through the church hall were at record levels on Thursday, wrapping around and outside the hall. Whether you were inside or outside under the big tent, or even on a church tour, this festival had a variety of things to experience that left you nostalgic for all things Greek. 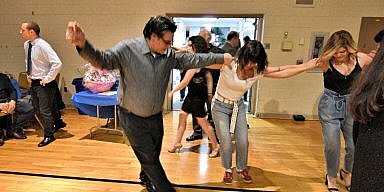 On a humid Friday night, the dedicated parishioners of St. Sophia, kept smiling, dancing and even managed to play it cool. And when it came time to show off their dance moves, they sent their church dance troupe, the “Asteria” to get things grooving. Folk dances from throughout Greece were performed throughout the evening with a live bouzouki filling in between sessions. And then the dancers turned it up a notch, past 11, on the volume-party control. The Asteria dance troupe danced through and in front of tent with fellow parishioners who joined in. 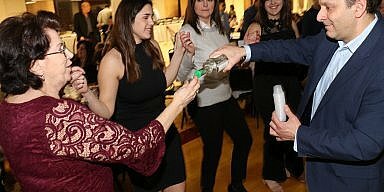 Along the way, they grabbed a few neighbors and friends who celebrated the evening, a la Greek style. The dancing came to a climax in front of their extraordinary Byzantine Orthodox church, making it both dramatic and beautiful to watch. The campus was a perfect place for an evening stroll with family and friends. The front lawn to the right, featured games and rides for the kids, while on the left, shopping, sweet treats, and Greek coffee shared the football long white tent. A little further down, a cafeteria style dinner area, featured Souvlaki, Gyros, and Kalamaria. But wait, there’s more. Inside the church hall, delicious platters of Moussaka, Pastitsio to die for and sweet pastries were lined up and circled the walls. The food options were endless and kept you spinning. A little shopping, a little coffee, and you’re off again, promenading across the campus to tour the latest iconography additions to the awe-inspiring church. Inside, Father Peter Thornberg shared Bible stories depicted in the mural iconography as a scene on the church walls. 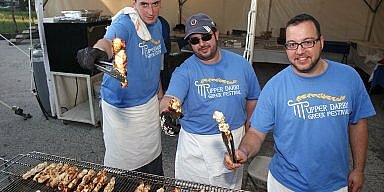 The experience of a perfect Greek festival hosted by St. Sophia’s lives up to its promises and delivers year after year. The parishioners open their hearts and give you a Greek welcome, “Philoxenia” they’re famous for. Stop in and experience this Greek Orthodox parish – love, culture, and faith. They will leave you longing and coming back year after year.